It sounds crazy, the idea of the United States attacking the Philippines with a weather weapon. First of all, the U.S. and Philippines are allies, so there would appear on the surface to be no motive. Relations between the two countries are strong and our defense capabilities are vital to the island nation. Then again you never know what could be an underlying motivation. It could be that the resulting U.S. aid response would ingratiate the people so much that they would welcome a stronger American military presence. Maybe some gentlemen’s agreements have been reached in exchange for the generosity of the U.S. Government. Demands might even have already been made behind the scenes and there needed to be some proof demonstrated. The Japanese didn’t believe we had a nuclear weapon at the end of World War 2, after all. Sometimes people have to be convinced. The Philippines could have nothing to do with the situation other than providing a non-threatening proving ground of the weapon’s capability and the opportunity to do some arm twisting in another part of the world. The videos make some interesting points regarding mobile weather modification platforms and their monitored activity. More and more it is becoming accepted that the ability to control the weather is a reality to varying degrees. Many patents for weather modification exist. That point, at least is not debatable. The SBX-1 mobile platform was documented as being deployed in March and the argument is made that this mobile platform was supposedly utilized to steer this storm. While this sounds bizarre, the pieces do fit together. 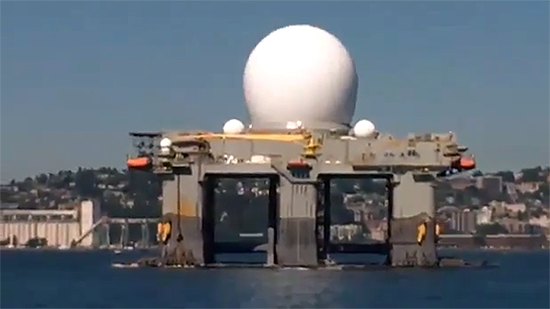 The premise that this SBX-1 platform is being deployed as a deterrent or precaution against Korea would make an excellent cover story. Often, the reason given for something such as troop movements or deployment of assets is eventually discovered to have little to do with the actual purpose other than to provide cover. The Philippines and America have a long and proud tradition of friendship, respect and cooperation. The repercussions of aggression such as this would be devastating and we can hope that the premise is false and that the storm was a naturally occurring event. Still, it is intriguing to examine all possibilities. The information is here to be considered; knowledge is power.